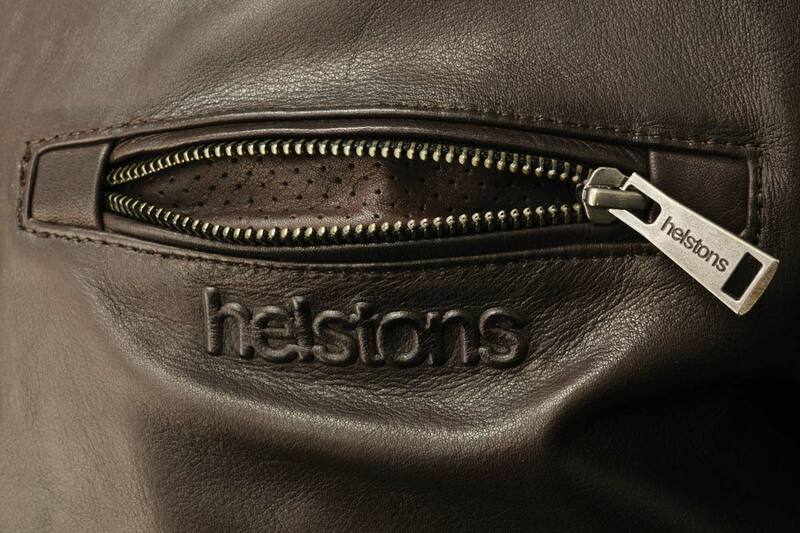 We are the exclusive importer of Helstons in the UK. We met the owner at a show in Paris about four years ago; we fell in love with their jackets, and the way they went about manufacturing them. They are simply our kind of manufacturer. We visit them in France three or four times a year, and what is refreshing is that they are more than prepared to listen to a different perspective. For both us and Helstons, the best-selling jacket in the range is one called the Ace Vintage. Like all of Helstons' jackets, it fits well; it comes with all the armour, including a back protector, a waterproof membrane, a pop-out thermal liner, and so on. The styling just seems to work, and certainly the patina of the leather plays its part. But, at a recent meeting, we discussed the Ace Vintage, and how it might be improved upon, particularly for the UK market, where leather jackets tend to be the preserve of those who ride mostly in the summer months. Well, this is the jacket that resulted from those discussions. 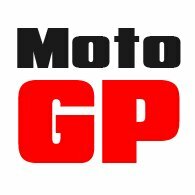 It is to be called the 'Ace Légende' and, initially, it will be available exclusively from Motolegends. The starting point for any leather jacket is, of course, the leather. The leather on the Ace Vintage is nice, but Helstons decided that this premium-quality jacket should be made from their finest, most supple, Italian leather. This leather is then 'washed' or 'tumbled' to give it a patina, and an even softer handle. Basically, the hides are put in a drum, a bit like a tumble-dryer, and the action of tumbling the leather as the drum spins give it a somewhat beaten-up appearance. 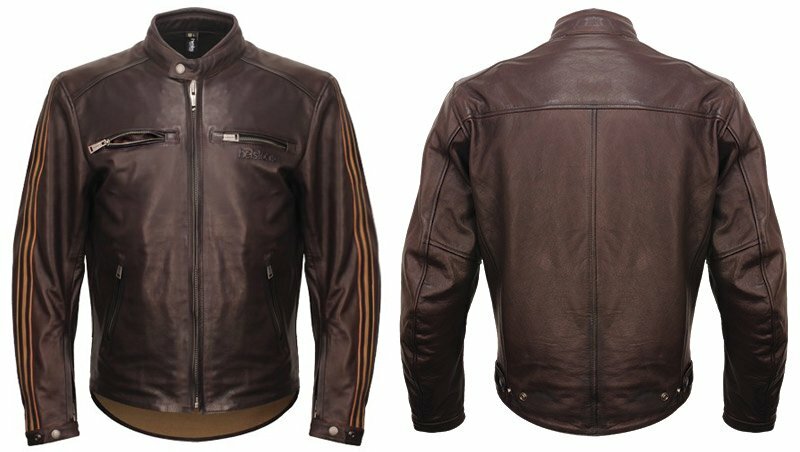 The same process is used on the Ace Vintage, but with this new jacket, the starting point, obviously, is a higher grade, and softer, leather. One of the reasons for the Ace Vintage's popularity has always been its fit. The proportions work. We like it to be fitted snugly because we know how the leather is going to give, but if the jacket fits on the shoulders, it tends to be right on the sleeves and elsewhere. If we had a problem with the Vintage, it was only that it was sometimes a little short at the back when you were sat on the bike. It reached the belt line, but no more. If you were tall in the upper body, it didn't always work. Likewise if you were leant forward over the bars in a classic, café-racer style. And so, we've increased the length of the jacket at the back by about three centimetres. 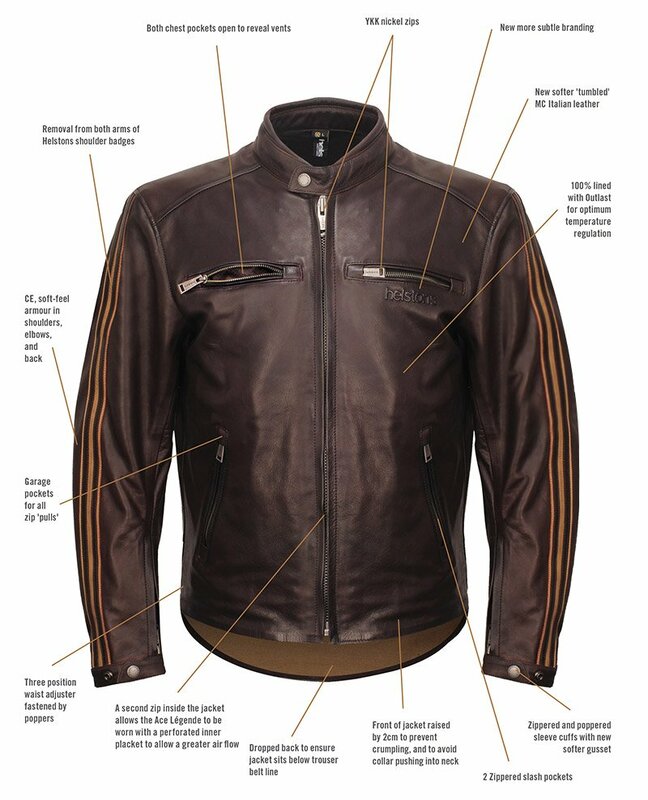 It is the mark of a proper motorcycle jacket designed for riding a bike, rather than for sitting in a café, that the front of the jacket sould be made shorter, to sit right on the belt line. A jacket that is long in the front will crumple at the hem, and may push the collar up into the rider's neck. The Ace Légende has been made longer than the Vintage at the back, and shorter at the front. We were, we explained to our friends at Helstons, never convinced by the need for a waterproof membrane in the Ace Vintage jacket. Nor were we particularly keen on the rather substantial thermal inner jacket. Helstons told us that, because of the more temperate climate in France, more riders wear leather through the winter months, where a waterproof membrane and a thermal layer were often deemed necessary. We felt, by contrast, that a waterproof membrane didn't really work in a café-racer style leather jacket, and we explained that a thick thermal liner in a jacket like the Ace meant that the jacket effectively had two sizes: one with the liner in, and one when it was removed. Not ideal, we opined. So, for the Légende, the jacket has no membrane, and no removable thermal liner. But maintaining the right temperature for the rider is always important, so we asked for the jacket to be fully lined in Outlast. This will provide extra warmth in the cold, and cool the rider down when it gets too hot. The two upper pockets, we suggested, look great, but nobody ever uses them. Could we turn them into vents instead? No problem, we were told. Everything else is really just detail. The zips are nickel instead of brass, and the zips now have what are called zip pockets to prevent the 'pulls' from blowing around in the wind. Instead of the Vintage's Velcro waist adjuster straps, the Légende has three-position popper straps. Perhaps the most contentious of the changes we discussed with Helstons was the branding. A lot of people like the Vintage, but we do occasionally get people who prefer a cleaner look, and so we have removed the badges from the arms, and have added a more subtle, embossed Helstons logo below the left breast pocket. Finally, as with all Helstons jackets, the Légende will come with soft-feel, CE-approved armour in the shoulders, elbows and back. We have to say that we are thrilled with the way this jacket has turned out and, for us, it is perhaps the perfect retro-styled, café-racer jacket. It has many of the features that made the Vintage probably the most popular jacket we sell. But the leather is nicer, and it will work better on the bike. 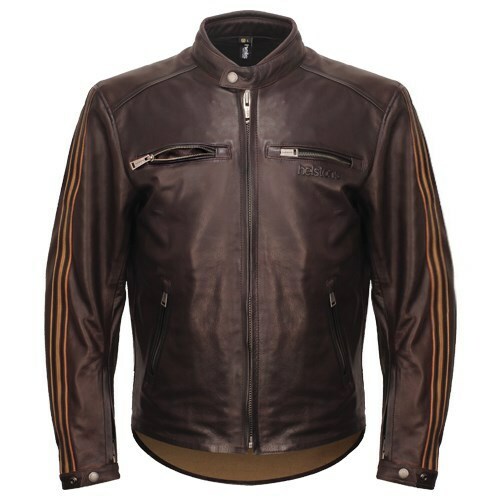 It is a lighter, more breathable jacket, more comfortable for riding in the summer. Yet with its Outlast lining, the Légende will still look after you through the spring and autumn. If we could design the perfect biker jacket, it would look just like this. In fact, we did, and this is how it turned out. Come and see it, and try one on for yourself. Click Helstons Ace Légende to shop the Helstons Ace Légende.